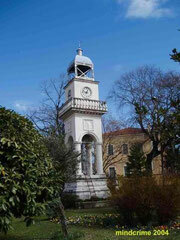 Ioannina is the largest city of Epirus with a population of 111.740 inhabitants in the year of 2011. It lies at an elevation of approximately 500 meters above sea level, on the western shore of lake Pamvotis. 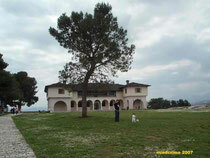 It is located within the Ioannina municipality, and is the capital of Ioannina regional unit and the region of Epirus. Ioannina is located 450 km northwest of Athens, 290 km southwest of Thessaloniki and 80 km east of the port of Igoumenitsa in the Ionian Sea. Ioannina has a Mediterranean climate tempered by its inland location and elevation. Summers are typically hot and dry, while winters are wet and colder than on the coast. Botanically, the region of Ioannina is dominated by robust, fragrant pine trees, many of which grow within the city itself, especially around the old castle, or fortress walls. The first indications of human existence in the regional unit of Ioannina are dated back to the Paleolithic period (38,000 years ago). 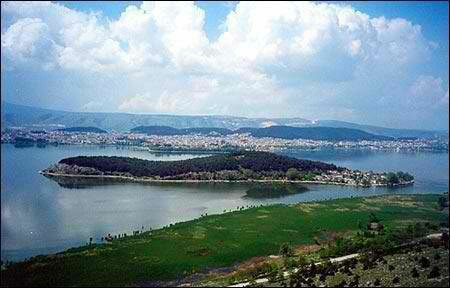 Ioannina was founded by the Byzantine emperor Justinian I in the 6th century AD for the inhabitants of ancient Euroia. From 10th to 11th centuries AD Ioannina was a part of Bulgarian Empire and the city was conquered in 1082 by the Normans; Alexios I recovered the city in 1108. In the 13th century, the creation of the Despotate of Epirus favored Ioannina, which became its second most important city after its capital, Arta but in 1318 Ioannina became tributary to the Byzantine emperor Andronikos II Palaiologos. During the years of 1337–1340 Andronikos III dissolved the Despotate of Epirus and Ioannina became once again part of the Byzantine Empire; a few years later however it fell to the Serbs. The city was the capital of the restored Despotate of Epirus from 1358 to 1416. In 1366 the Serb Thomas II Preljubović became the new overlord of Ioannina, under whose rule the city stood against Albanian attacks. After Preljubović's death in 1384, the city surrendered to Esau de' Buondelmonti and Carlo I Tocco. After the death of Tocco in 1430 Ioannina became a part of Ottomn Empire. During Greek Independence War from 1821 until 1828 Greece got independent but Ioannina was incorporated into the Greek state only on 21 February 1913 after the Battle of Bizani in the Balkan Wars. 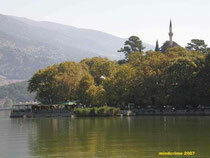 One of the most notable attractions of Ioannina is the island on Lake Pamvotis. Passengers are ferried back and forth from the mainland to the island (about a 15-minute ride each way) on small motorboats which run on varying schedules, according to the season (about once every half hour, or more, in the spring and summer, much less frequently in the winter). Tourists can visit the monastery of Agios Panteleimon which has been converted into a museum containing information and paintings, as well as re-creations of Ali Pasha's lounging and living quarters. The Island Museum is not the only attraction on the island: there are many gift-shops, taverns, churches and bakeries on the island's winding streets. Some of the people of Ioannina even choose to make the tiny island their yearlong home, with simple rowboats moored outside their homes, or in small marinas, in the event they need to get to Ioannina proper when the motorboats are not running. The island of Ioannina in Lake Pamvotis has six monasteries. The National Archaeological Museum of Ioannina includes archaeological exhibits from 4 regional units of Epirus. You can see here all the history of Epirus from prehistoric Time until 19th century. 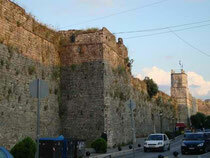 The Ioannina castle is in the center of the town, and was the heart of the Despotate of Epirus, and the Ottoman town. The maze-like layout of the castle’s streets was allegedly designed to confuse pirates of old who breached the castle walls: they would get lost within the fortress, and thus be captured before escaping with their bounty. The Fethiye Mosque is located in the Ioannina Castle. The name means the conquest Mosque was built in 1430 on the ruins of a Byzantine church. Originally a wooden post in 1611 but was rebuilt stone. The final form was given by Ali Pasha in 1795. The Aslan Pasha Ottoman Mosque now houses the Municipal Ethnographic Museum and its three departments, Greek, Ottoman Muslim and Jewish. The Old Ottoman Library building is ruined. You can see it only from outside. The Municipal Gallery of Ioannina is housed since 2000 in Pyrsinela neoclassical building, built in 1890. Basil Pyrsinella who served as mayor of Ioannina, spent the entire movable and immovable property in 1958 in the municipality of Ioannina. In 1960 he created the first Regional Municipal Art Gallery in Greece, which first opened in the building until metestegasi Mela in today's housing. The works of the Gallery's collection are major stoys Modern, painters and sculptors, which was collected through purchases and donations from various collectors and artists. This includes about 500 works, paintings, drawings, prints, pictures and sculptures. The Museum of Fotis Rapakousis is located in the complex of Aslan Mosque, in north-west of the fortress citadel of Ioannina. The City Knights, by mutual concession relationship between him and the collector, the collection of hosts on its premises, since 2000. This has included so the cultural resources and currently operates in parallel with the Municipal Folklore and Ethnographic Museum, housed in Aslan Mosque. The entire collection contains 6,000 objects, grouped in four categories: weapons with their accessories, jewelry from the 18th and 19th centuries, various, ceramics. The Byzantine Museum is housed in a building rebuilt on the ruins of seraglios of Ali Pasha, which was completely destroyed by fire in 1870. The museum opened in 1995 in order to preserve the findings of the wider region of Epirus, chronologically covering the early Christian, Byzantine and post-Byzantine period. Also outside the museum from the report of collections, and a cultural center after hosts musical and theatrical events, periodic reports, etc. The collections include early Christian and Byzantine sculptures and exhibits Arta, ceramics, books, pictures and valuable collection of silverware. The Cathedral of St Athanasius was completed in 1933. It was built on the foundations of the previous Orthodox Cathedral which was destroyed in the fires of 1820. It is a three-aisled basilica. It has become a place of pilgrimage for the martyrdrom of St George of Ioannina, an orphaned youth hanged in public by the Turks in 1838 for proclaiming his Christian faith. The Jewish Synagoge of Ioannina: During the Ottoman period, the Jewish community, both Sepharadi and Romaniote, experienced a flowering. The Jews of Ioannina were an active presence in the city's life until March 1944, when the German occupation troops arrested the entire population, 1,870 strong at the time, along with Jews from Preveza, Arta and Corfu, and deported them to the Auschwitz-Birkenau concentration camp, where most perished. 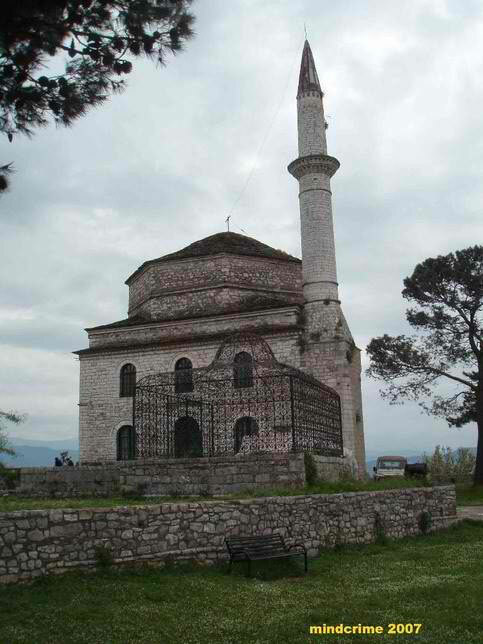 Today the community compirises about 60 persons and the synagoge lies inside the Castle of Ioannina. Date 7th Century. Near Ioannina, 10 kilometres (6.2 miles) south of the city, lies the Pavlos Vrellis Greek History Museum, the biggest and most important museum of wax effigies in Greece, also one of the best in the whole world. 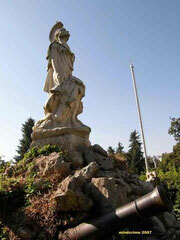 Established on year 1995 this second Museum of Pavlos Vrellis (died 2010) is the result of the personal work of one man. You will meet the picturesque village Perama only four kilometres from Ioannina on the road that goes from Metsovo to Trikala. A mythical world beyond your imagination waits for you there to discover it. 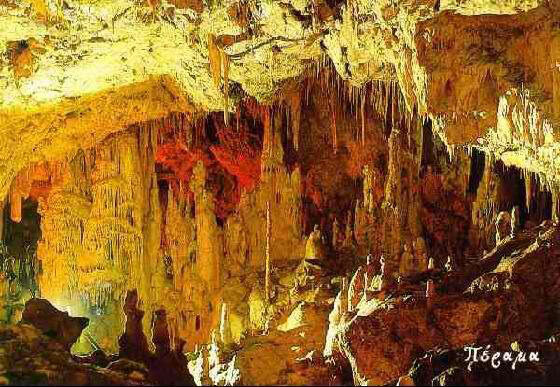 The Cave of Perama was created 1.500.000 years ago in the interior of Goritsa hill, exactly above the village. It was discovered by residents of Perama in 1940 and speleologists Anna and Ioannis Petrohilos started exploring it in 1956. This real ornament is known for the variety of stalactites and stalagmites that are found there and it is included in the best caves in the world. The temperature in the interior is maintained constant in 17 οC. You will meet a lot of rooms with particularly rich decor on the way whose length is about 1.500 metres. Your guide will explain how the Cave was created and will report the names that the couple Petrohilos gave to the unique shaping and the rooms you will see.